Please do not ask me: how to get to the temple, booking, address, and similar information. I am the webmaster. Any information please find on the website or on the internet. His interest in spirituality and the Hare Krishna movement started in 1986 when his friend Karel Barton introduced him to the Hare Krishna philosophy. Together with others for example Tattva-darsi das, Karel (now Krishna Caitanya das) , Angara-purna dasi, Boris, Jana, Igor, Peter, Svatka, Vlastik, Roman (now Rukmini-ramana das), Lubos (now Nila Madhava das) and others tried to practice and preach Krishna consciousness in former Czechoslovakia. After police interrogations some devotees left the country (as Tattva-darsi, who went to Sweden to translate books) and some had withdrawn themselves. Around 1987, Radha Raman das together with the most enthusiastic devotees bought an old big house in Lansperk (Eastern Bohemia) where the first Hare Krishna center was founded. Radha Raman das was one of the organizers and cooperated also with Turiya das who tried to preach and help devotees from Sweden. 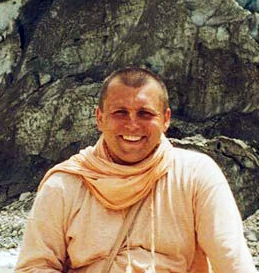 In 1990 on Gaura-purnima in India he received first initiation and 1994 in Amsterdam second brahmin initiation from one of the first Prabhupada's disciple Tamal Krishna Goswami. Around 1994 he moved to Radhadesh, Belgium, where he became the chief of the constructing department. Here he could use his architectonic education. His interests are books, computer library and traveling to India's holy places.